﻿ Rowsvilla Self Catering Guest-House Kepulauan Seychelles. JIMAT di Agoda.com! Ada soalan mengenai Rowsvilla Self Catering Guest-House? Sesuai untuk berehat dan bersantai, Rowsvilla Self Catering Guest-House terletak di area Pulau Mahé di Kepulauan Seychelles. Dari sini, tetamu boleh menikmati akses mudah kepada semua yang bandar meriah ini boleh tawarkan. Syurga untuk berehat dan bersantai, hotel ini akan menawarkan pembaharuan penuh hanya beberapa langkah dari pelbagai daya tarikan bandar seperti Kuil Arul Mihu Navasakthi Vinayagar, Pasar Victoria, Victoria Clocktower. Menawarkan tetamu hotel perkhidmatan yang unggul dan pelbagai kemudahan, Rowsvilla Self Catering Guest-House komited untuk memastikan penginapan anda berada di tahap seberapa selesa yang mungkin. Pilihan kemudahan kelas atasan seperti pengemasan harian, khidmat teksi, tempat letak kereta, bilik keluarga, kemudahan BBQ boleh dinikmati di hotel. Alami bilik dengan kemudahan berkualiti tinggi sepanjang anda menginap di sini. Sebahagian bilik menyediakan penyaman udara, beranda/teres, katil panjang (> 2 meter), kipas, internet wayarles (caj dikenakan) untuk memudahkan tetamu berehat dan kembali bertenaga. Di samping itu, pihak hotel menawarkan aktiviti rekreasi untuk memastikan anda mempunyai perkara untuk dilakukan sepanjang penginapan anda. Nikmati perkhidmatan yang sukar ditandingi dan lokasi benar-benar berprestij di Rowsvilla Self Catering Guest-House. The house is very nice, full equipped for cooking, air conditioner, everything is new and clean. It's located 5 minutes from the beach and the small village. The bus stop in just in front of the house. There is not free wi fi. I reserved for 2 night but the first night I had to stay in an other guest house (very good) because of an overbooking, than the owner gave me a late ceck out with no charge. Definitely I can raccomand this guest house! Great location ! 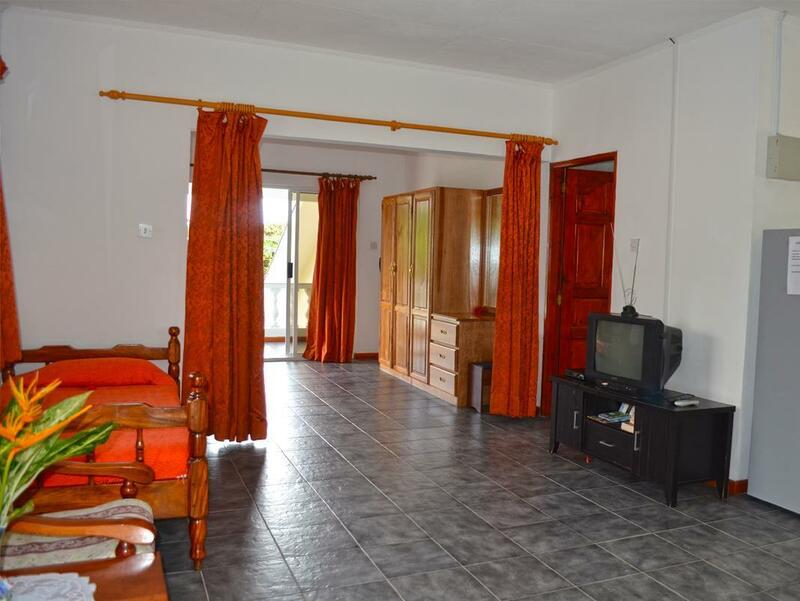 Walking distance to Beau Vallon beach and plenty of stores. Money exchange, cell phone and even car hire are close by. Rupert and the staff were great and the Villa was awesome. We rented the big bottom apartment and it was huge. Can't wait to go back again !! Beau Vallon Beach is just 5 minutes walk. Many supermarkets at 5 minute walk in other direction. Bus stop exactly next to the gate. Some days host/s are available only in morning hours. Host/s offered taxi ride in city at competitive rates. Overall, a safe place to stay at good location. Rowsvilla Self Catering Guest-House is a nice place, I liked it very much and would recommend to the travelers. Beau Vallon beach is in 5 minutes walking. Shops, supermarkets. restaurants, take-aways, everything is near, but around guesthouse there’s no noice, it’s a quiet place. My room was big, comfortable, beautiful, very clean. Fridge and aircon working properly, kitchen well-equipped, the bed and linen were quite excellent. Stuff is friendly, helpful, pleasant people. Everything was fine, no disadvantages. Transfer from ferry and to airport was punctual and comfortable, and not so expensive, than taxi. They also let me to checkout later, to get a fast shower later, and kept my luggage till departing time. I had a wonderful time at Rowsvilla and if I come back to Mahe, would be very glad to stay at this place again. The apartment was clean, big, well equipped, and very comfortable .The only minus is that the only way to have the Wi-fi is with a pre paid card. Nice location is close to Beau Vallon beach, supermarket, bank, bus stop, and good restaurants. The transfer from the ferry to the villa and from the villa to the airport with Rupert was perfect. He was helpful and friendly, he answerd to all of our questions.Thanks you for everything. The location is great, near the famous beach by walking distance. A bus stop on the opposite side to downtown. We were stay in the lower flat with toilet & shower and an open kitchen. Everything is OK and we have fun to stay there. It is a spacious and renovated appartment. 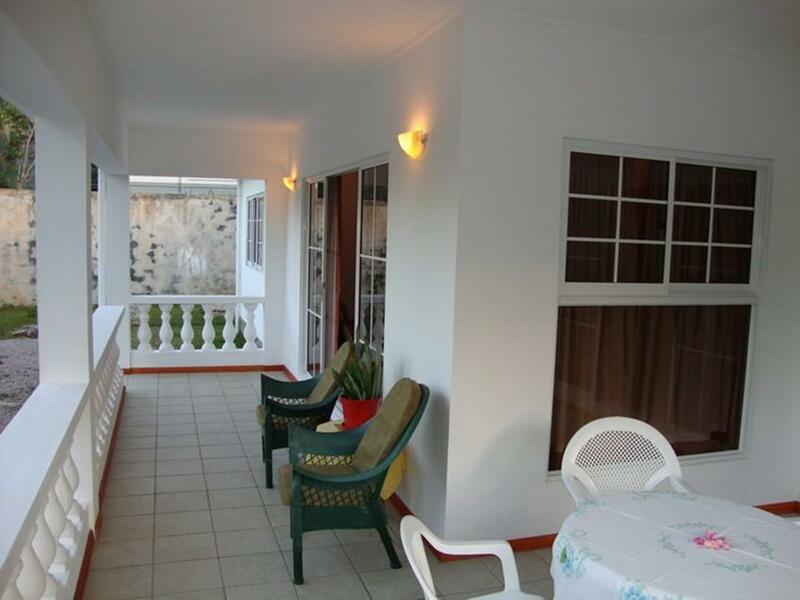 It is situated 5-6 minutes walking distance to the beach. Staff is polite but it is only at the appartment a couple of hours in the morning and for a short term in the afternoon. Nice location with several steps to the beach. We booked the smallest studio apartment but it is spacious enough for two people. You have everything equipped in the kitchen. The host is very friendly and would offer help. We really enjoyed our stay in Rowsvilla with it's great location nearby grocery stores and a 10 minute walk to Mahe's most popular beach - Beau Vallon. The host - Rupert - was very accommodating, reliable and helpful at all times. It was nice, the staff is awsome and helpfull. Everything was great, all the equipments were upto the mark. Except that the AC is of inferior quality and should be changed. The location is great. Tessy and Rupert were just great, . Thnx. Lovely and helpful host, very clean apartment with all equipment you would need, closeness to the beautiful beach, Close to several smaller shops. Very easy to catch the bus to Victoria, bus stop outsider the building. The guest house offered transfer from airport and to the ferry in Victoria at a cost, worked really well. The upstairs apartment was spacious and clean, and the place is in a great location - close to the supermarket and an ATM. The beach is about 10 minutes by foot, but you can also use your car and everything is within reach. Tessy, the owner, was wonderful and very helpful regarding questions we had and recommendations for things to do. Happily recommended! 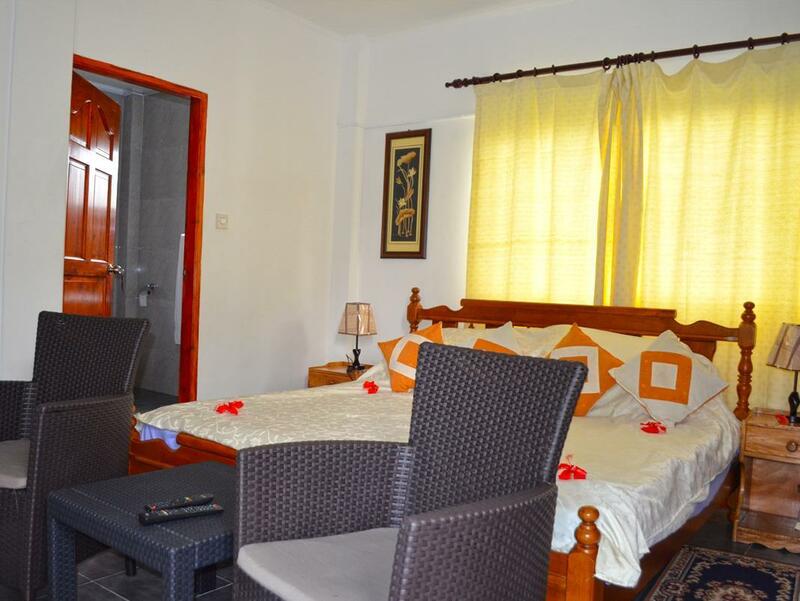 STAY ONLY ONE NIGHT WITH 4 PERSONS IN THIS HOUSE.GOOD LOCATION, VERY CLOSE TO THE BEACH.JUST CROSS THE MAIN HOTEL OF Beau Vallon Bay--Berjaya Beau Vallon Bay Resort & Casino,YOU CAN REACH REACH.THE HOUSE IS BIG WITH GARDEN VIEW.KITCHEN IS ALSO WELL EQUIPED. We spent 3 nights of our Seychelles tour at Rowsvilla and it was a perfect choice for us. Rowsvilla has perfect location - transport, beach, supermarkets, ATM... All equipment was fully functional. They are friendly, customer-oriented, arranged airport transfer, internet access and gave us all information we needed. Thanks Rowsvilla for making our stay carefree!